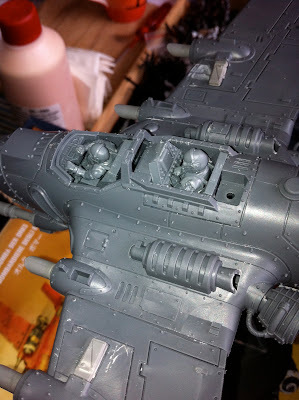 When the ork flyers came out, I noticed that they looked less 'orky' than I expected, and that with a little love and DIY, they could make a very reasonable imperial ground attack fighter craft. below some foto's of my current work-in-progress Imperial Guard Vendetta-without-transport-capacity. For the build I used the pilots and their seats from my Valhallan Valkyrie. Since I painted it's widows an oily brown, I had noneed to put them in the Valkyrie. The lascannon heads originate from a number of cadian heavy weapon team sprues. Other than cutting and filing some ork-bits of not much more needed to be done. All that remains is to make the cockpit windscreen fit properly.